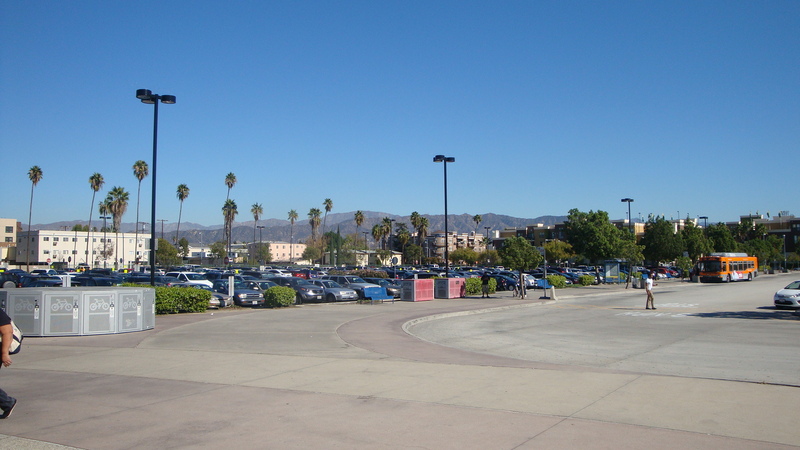 The NoHo Station parking lot as seen from the portal to the Red Line. In order to better manage demand for parking at two very busy Red Line subway stations and create more parking spaces for transit riders, Metro will begin charging $3 a day to park at the North Hollywood and Universal City/Studio City stations on Monday, April 24. Both lots have been free since the two stations opened in 2000. Over the years, it has become more challenging — if not impossible — for transit riders to find parking at either station unless they arrive very early on weekday mornings. One problem is that a number of non-Metro riders use the lots to park for free, meaning those who want to park-and-ride are left without a space. Automated parking systems will be used at each station. There will be Metro ambassadors on hand in the first few weeks to help everyone get used to paying. The pay stations that will be used at NoHo and Universal stations. •The $3 fee covers 24 hours of parking. You can park at either station for up to three days at $3 per day. •Failure to pay will result in a $53 citation. •Existing monthly permit holders will have their permits automatically converted to the new system. •Those who want to sign up for the waiting list for a monthly permit can do so at LAMetroParking.net. The same site also offers carpool parking permits that allow patrons to split the cost of a monthly permit between two or three people. Finally, a few thoughts as I know that new fees are sometimes not the most popular thing in the world. Here’s an interesting example from the Expo Line. With a daily fee of $3 in place at all Metro-owned lots along Expo, there remains spaces open in each of those lots — even with the Culver City lot having closed to accommodate a new development being built there. To put it another way, in exchange for a $3 daily fee, those who want to drive to the Expo Line and park can be fairly certain they’ll get a space at any time of the day. We know there are some people who can only ride transit if they can drive to the station. This move will hopefully benefit many of those riders, as there should finally be spaces open beyond 8 a.m. It’s also worth noting that parking lots along the Orange Line — which offers a transfer to the Red Line at NoHo Station — will remain free as those lots are under-utilized with about 27 percent of spaces occupied on the average day. Related: new details and open house on Saturday for NoHo joint development. All Riders – Don’t let this Happen!!! Contact your LA Council members (Mine is Mitchell Englander), LA County Supervisor (Kathryn Berger – (213) 974-5555 or kathryn@bos.lacounty.gov – she sits on the Metro Board), the Mayor. Enough taxation is enough. Proposition M – passed, that was $$, and now the commute is doubled. This is unfair to the riders, like myself who have to already bear the State tax increase of .12 per gallon of gas, and $100 DMV increase per vehicle. Don’t let this happen. If we speak up, things will happen. It’s also a good idea to contact the Mayor’s office about this. Well, usually they just steal from the “rich”. Now they are stealing from all of the productive people and maybe they will decide one party rule is not such a great idea. Too many people want nice things paid for by other people and forget that someone eventually needs to pay the piper. Why can’t the system be setup as a validation type of system to accomplish the true goal? I understand the need given people using it for non-transit purposes and abusing the lot. If the system doesn’t detect they used the transit that day (which it can by the TAP card), when they exit the lot, they should be charged. If they used the transit that day, when the exit, it shouldn’t charge them. How hard is that? That will accomplish what METRO is saying the reason for this is. You shouldn’t be charging actual transit riders to punish the NON riders for abusing the system. A big shout-out to the Metro Parking team. I didn’t get the name of a specific person to give credit to, but I sent my questions to Metro Customer Service who passed them on to the parking team who responded this morning. So here’s a bunch more info about what to expect. Do not take this as verbatim from Metro, some of the wording is mine, however, it should be all factually correct. Option 1: Pay daily at new machines using a credit card. $3/day+several minutes each day depending on lines at machines. You will also need to have your TAP card present at the time you pay*. 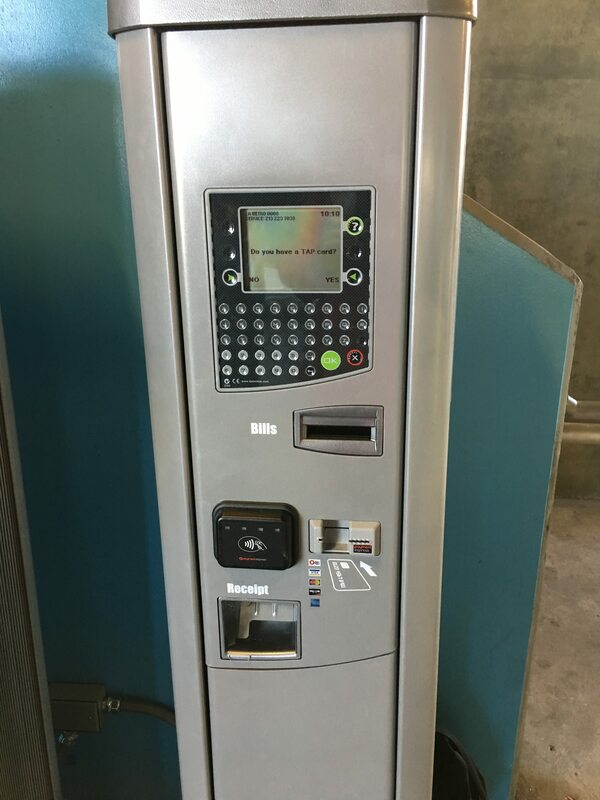 The parking machines will be located on the concourse on your way to the station portal. New signage will direct people. Option 3: Monthly pass. $59/month, online. There may still be a waiting list, so they recommend registering now so you can get a permit. “Monthly Parking” replaces “Lot 15 Permit Parking” so the rules of the lot remain – green spaces for those who are paying monthly. What if you just want to pick someone up? What if you drive into the lot and can’t find a space and leave again? Parking is available on an as-available basis. When this was implemented at the Expo Station, the end result was more parking available. They expect that to be the case at North Hollywood (and Universal) as well. The expectation is that there is a lot of non-transit riders using these two lots. What if you have a monthly pass and can’t find a space? I asked this question poorly – their response is that you can park anywhere in the lot with your monthly pass. At the NoHo Open House last weekend they showed off signs that showed the number of monthly and daily spaces open in the lots. I don’t know if they’re planning to have those by launch, but if they do, you’ll know before you enter the lot if there are spaces. Is there a discounted rate for people with permanent handicap placards? Are you working with the city to add neighborhood permits to the areas around the station to avoid pushing the parking out to the neighborhood? Metro is working with Los Angeles — in other words, pay attention to all parking signage around the station. There may be limits to discourage transit parking or eventually permit zones to protect parking for residents and business patrons, but it’s a L.A. City issue. Is there a discount for the crappy (my word) overflow lot at North Hollywood? Was FasTrak considered as a payment method? When will you start putting up signage? Is there a cost for motorcycles? Thank you so much James! Still not happy and am looking at alternatives. If they truly wanted to manage parking they would eliminate the green zones where the majority of spaces are. This is just about making more money. Why charge us only $3 a day? Make it $100 a day to park at the metro, and you’ll have the entire parking lot free, 24/7! I have been riding the Red Line since 2009; and the conditions on the metro have become increasingly worse: unsanitary, filled with sleeping homeless people and gangs blasting loud music and dancing in the cars, trains get delayed, escalators broken. We live in a civilized, democratic society! First, improve the conditions, and then charge people extra. To fellow metro riders: please boycott the new parking fee! This opening statement to the new system is totally flawed. Punishing transit riders that actually ride Metro for abusers of the parking lot is like spanking your good kid for not stopping your PIA kid from doing wrong. Here’s an interesting thought: did Metro stop to think about the fact that when they starting charging for parking that, maybe, just maybe folks reconsidered whether riding Metro was worth it anymore? And possibly many riders thought to themselves…nah at this point $6.50/day for metro is only marginally better than paying for parking at work, so I’ll go back to driving to work. This may be the reason for Metro’s newly discovered vacant lots. Maybe? In addition, the argument that it provided more spaces once they started charging does not improve the commute experience for Metro riders, it simply makes it so that Metro riders pay the price for abusers of the lot to NOT park there. I hope as EG stated above, that the parking system can be setup as a validation system that once proven that you actually used metro your parking will be complimentary. This way you can theoretically “charge” me an obnoxious amount (e.g. $100/day) and once I show that I rode metro, the parking system will return my “fee”. If it was truly about managing spaces they would eliminate the monthly passes. This scheme may actually make the parking lots much worse. Someone in the area might have felt guilty about parking in the Metro lot if they weren’t riding. But now, they can get a TAP card with a few dollars loaded on it and get the cheapest parking lot around. And since they’re paying, they park guilt-free. Unless the system checks if people are actually riding, there’s a gaping loophole. Yeah, that was my thought for Universal – $4.50 + $1.75 per passenger, park all day. Just take a few minutes to pop down and tap in. I recently put $100.00 dollars on to my TAP Card, once that $100.00 Dollars is used up, I will be driving to DTLA in hopes of adding to the traffic congestion, and global warming. I will never forget hearing Mayor Garcetti say that his goal is to make traveling in the City of LA so frustrating, so difficult and so expensive that people just give up. It’s Woking! This is not some fresh new outrage, it’s pretty standard practice at other transit systems. In the Bay Area, BART will charge you $3-9 per day to park. Since the lots are full, they keep raising the price. Park for Universal at North Hollywood, you’re a transit passenger. Good idea. Just for the record, ways of getting to the Red Line without paying for parking include walking, biking, and taking a Metrobus (not to mention skateboarding! ).